Posted by thetickthatbitme in Whole Person. I don’t know about you, but sometimes going to the doctor makes me feel sicker! Why is that? Maybe it’s because I often feel that I have no control over my patient experience. Over the years, I have developed strategies for being proactive about my medical care that assist my doctors in understanding my needs and concerns AND give me more control and peace of mind. So here is my *proactive patient manifesto* of sorts. Keep organized medical records. At most doctors’ offices, you can request copies of all your records, including office visit notes, procedure/surgery notes, labs, and imaging. When you get labs, always request that the lab mail a copy of the results to you (in addition to forwarding them to your doctor). When you get imaging, you can often get your own copy on CD. I keep all of my records in a three-ring binder and use tabs to sort them into categories like infectious disease labs, general labs, gastroenterology, urology, neurology, ophthalmology, etc. I also typed up a one-page medical history summary that lists my past surgeries, medications, and diagnosed conditions, which I keep at the front of the binder. I bring this binder to every doctor visit so that 1) if my doctor needs to copy my records, he/she can do so easily; 2) doctors and their staff know that I mean business and I pay attention; and 3) I can hold my doctors accountable for explaining my current condition in the context of my medical history. For example, I may have lab work ordered by one doctor that is related to a condition for which I am seeing a different specialist. Communicate as openly and directly with my doctor as I possibly can. This means honestly disclosing symptoms and describing concerns. This means that when my doctor says something I don’t understand, I must ask him/her to repeat it. This means keeping each specialist informed of what’s going on with all my other specialists (the medical history summary really helps with this). Come to the doctor prepared with a (written) list of questions and concerns. This is essential to me because 99% of the doctors I’ve been to always try to rush me out of the appointment after the first 5 to 10 minutes. Have you ever noticed how when doctors ask us, Do you have any questions? our instinct is always to say no? A discourse analysis professor I had in grad school had studied this phenomenon in doctor visits and found that the use of the word “any” deterred patients from asking questions! He suggested that doctors instead ask, Do you have some questions? because this seemed to elicit a more positive response from patients. My doctors have always used any, but it’s much easier for me to respond, “Yes, I have some questions,” if I have a list of them right in front of me. Report incidents of mistreatment by my doctor or his or her staff. If your doctor is part of a large practice or a hospital group, there is usually a Patient Experience or Risk Management department or person whom you can contact to report inappropriate treatment. I recommend writing down a detailed account of what happened as soon as you can. Often, these experiences can be so distressing that we forget the order or the particulars of what happened, and that can compromise our credibility when we go to report the incident. When you speak with Patient Experience, try to communicate what outcome you are hoping for, whether it’s waiving the fee for your appointment or a simple apology. If you are mistreated in a doctor’s office, I don’t recommend making a scene or threatening to sue. Doctors take being sued very seriously, and if you sue one doctor in the town (or county, or state) you live in, you may have difficulty finding another doctor to treat you. Stay informed about research related to my health conditions. This means reading articles, asking doctors to recommend written resources, participating in patient support groups, and—of course—writing this blog. Am I missing anything? 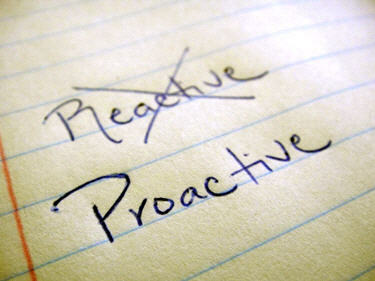 What strategies do you have for staying proactive?